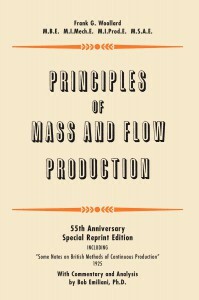 This is the back story to the recently re-discovered classic book, Principles of Mass and Flow Production. To most people, the history of progressive management begins and ends with Toyota. It seems as if Toyota developed everything of importance: the principles, the methods and tools, and so on. From a historical perspective, the Toyota-centered view of the development of progressive management, whose objective is to achieve flow, is not accurate. Toyota built on the ideas of others, improved various ideas (sometimes greatly so), discovered independently what others discovered previously, added many of their own unique ideas, and so on. From this, they created the coherent system of progressive management that we so admire but struggle greatly to even partly imitate. But another company came close to achieving what Toyota had accomplished in the post World-War II period up to about 1970, minus kanban. The company was Morris Motors, a British automaker that held a commanding market share in the UK in the the 1920s and 1930s. The architect of their flow production system, beginning in the engine shop (as did Toyota) was a mechanical engineer named Frank George Woollard (1883-1957). Woollard’s work in the 1920s and 1930s makes clear that efforts to achieve flow drive everyone to the same principles and practices. I came across Woollard’s book, Principles of Mass and Flow Production, (originally published in 1954), in a footnote in the 1959 book The Motor Industry, a landmark study of the British automotive industry from the early 1900s to 1957, written by economists George Maxcy and Aubrey Silberston (a book that heavily influenced Eiji Toyoda). When I came across the footnote in 2007, I could not believe my eyes. I had in my possession every book on progressive management dating from the 1880s to present – or so I thought. I found a used copy of Woollard’s book online and immediately purchased it. I tore into it upon its arrival and could not believe what I was reading. I said to myself, “I have to re-publish this book. It’s amazing!” And so that’s what I did. I located pristine (unmarked) used copies of Woollard’s book and of conference proceedings that contained his landmark 1925 paper, “Some Notes on British Methods of Continuous Production.” These were needed to create digitized images of the original works for re-publication. This was exciting stuff! Before I would re-publish Woollard’s book along with his 1925 paper, I did two years of continuous research on Woollard, both his life and his work. I discovered never-before-seen archives in various places, took two trips to Birmingham, U.K., and I spoke with the last living person who knew Woollard, his close friend Mr. David Bramley, age 95 (he died a sixteen months after my visit, in 2o10, at age 96). The 55th Anniversary Special Reprint Edition that I published in 2009, also contains the results of my extensive research on Woollard. The Preface describes Woollard’s life and his accomplishments as a mechanical engineer (skilled auto parts designer), machine designer (designed the first automatic transfer machines), and flow production visionary (everything but kanban). The Foreword describes, in meticulous detail, how Toyota in the late-1930s was likely influenced by Woollard’s work. The Introduction focuses on Woollard’s successful efforts to achieve flow, which also was built on the work of others, but with unique British contributions. I also added a summary biography of Woollard, a list of Woollard’s publications (he wrote extensively), and a selected bibliography of Morris Motors, Ltd.
Woollard’s work is very important for many different reasons. One such reason is that Woollard recognized that flow production will not work properly if used by management in a zero-sum (win-lose) manner, which is an insightful and distinctive feature of Woollard’s flow production system, and shows he understood the importance of what is today called the “Respect for People” principle in Lean management. Woollard’s 18th and final principle of flow production states: “The system of production must benefit everyone – consumers, workers, and owners” (Woollard, 1954, p. 51). Re-publishing Woollard’s book was a labor of love that cost me thousands of dollars. Book sales have been low, as expected (you can help change that). Nevertheless, I am so proud to re-issue Woollard’s book because he made major contributions to progressive manufacturing management practices in the British automobile industry of the 1920s. The re-discovery of Woollard’s work is significant because it changes the timeline for discoveries and attributions of key accomplishments in progressive Lean management. Woollard was a remarkable man whose amazing work was lost to time and indifference. Not any more. His work on flow production and his prescient innovations in industrial automation ensure him a prominent place in the history of production engineering, automation, and industrial management.